The date of sowing (or planting) of an agricultural field has an enormous influence over crop health and yield. With climate change, in many cases alteration of sowing dates may be critical for adapting to changing temperature and precipitation. Sowing too early can increase the risk of frost damage, while sowing too late can reduce yields. While an individual landowner can keep records of their sowing dates, determination of sowing dates across large and matrix agricultural habitats is a challenge. Yuval Sadeh and team from Monash University and The University of Queensland used Planet’s Dove constellation to make remote estimates of sowing dates for production wheat in Australia, which exceptionally accurate results. Across a matrix of National Variety Trials, including a mix of whole fields and sub-field plantings, Sadeh et al. detected 85% of sown fields, with an R2 of 0.99. While some limitations were noted, especially the need to determine a threshold for sowing in a semi-automated fashion, the study suggested that field-level sowing dates could be determined on a near daily basis at low cost. Read the full paper, which is published as open access, in the journal Computers and Electronics in Agriculture. 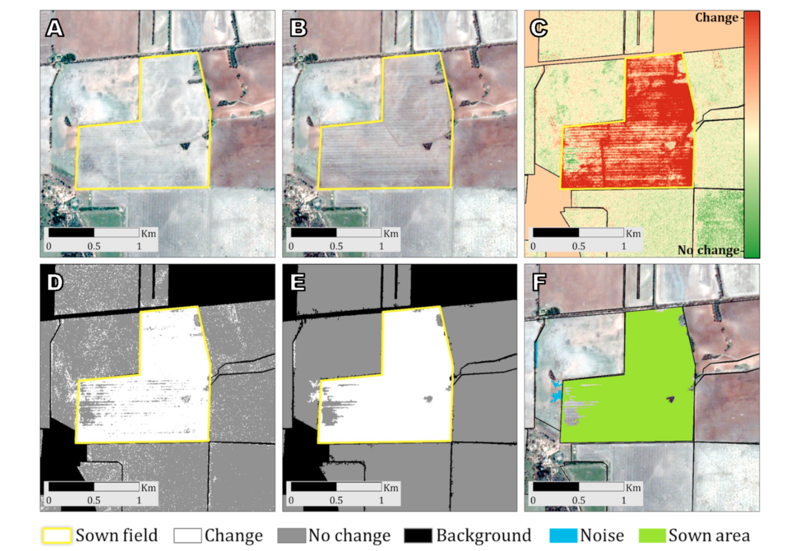 Yuval Sadeh and team used Planet’s Dove imagery to detect sowing dates for Australian wheat with 99% accuracy.